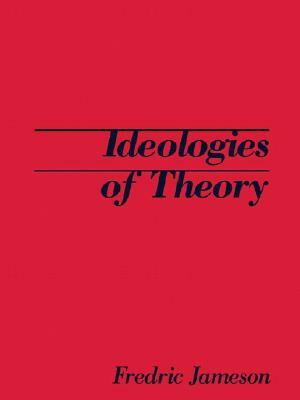 Ideologies of Theory, updated and available for the first time in a single volume, brings together theoretical essays that span Fredric Jameson’s long career as a critic. They chart a body of work suspended by the twin poles of literary scholarship and politcal history, occupying a space vibrant with the tension between critical exegesis and the Marxist intellectual tradition. Jameson’s work pushes out the boundaries of the text, making evident the interaction between literature and the disciplines of psychoanalysis, philosophy and cultural theory, all of which are shown to be inseparable from their ideological milieu. Fredric Jameson is Distinguished Professor of Comparative Literature at Duke University. The author of numerous books, he has over the last three decades developed a richly nuanced vision of Western culture's relation to political economy. He was a recipient of the 2008 Holberg International Memorial Prize. He is the author of many books, including "Postmodernism, Or, The Cultural Logic of Late Capitalism," "The Cultural Turn, A Singular Modernity," "The Modernist Papers," "Archaeologies of the Future," "Brecht and Method, Ideologies of Theory, ""Valences of the Dialectic," "The Hegel Variations" and "Representing Capital."